Wow! 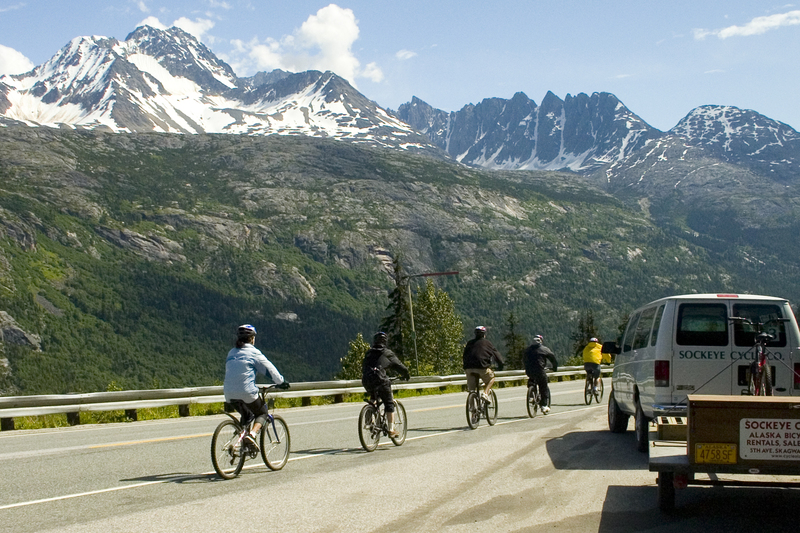 The White Pass Railway and Klondike Bicycle Tour looks like great fun! Sometimes it’s hard to pick just one tour. When you visit Skagway, you have a lot of tour choices. Some tours are active and others are more like sightseeing. Obviously, the White Pass Railway is a very popular tour that many people say not to miss. But perhaps you’re the kind of person that likes to go hiking, rafting, or ride bicycles. Boy howdy, are you in luck! Today we are going to discuss the White Pass Railway and Klondike Bike Tour because it’s offers something for active people and lazy people. Skagway has a road and railroad tracks leading out of town. The tracks are for the White Pass Railway and the road is called the Klondike Highway. They follow different paths until they intersect 28 miles north of Skagway at a place called Fraser, British Columbia. This is also where Canadian Customs is located. At Fraser, you can get on and off the train, which makes it possible to ride back to Skagway via a different means of transportation. Obviously, you need a passport because Canada don’t play. The tour starts with the White Pass Railway. You travel up to the White Pass Summit and see all sorts of pretty things. Most of the time, you’re just sitting there looking out of the window while the tour guide tells you all about the train’s history and Klondike Gold Rush lore. Fun stuff. The ride takes about an hour and a half. Then you pull into Fraser and get off the train. You don’t get on your bicycle right away. You take a van a few miles back up the mountain until you’re at the top and then get outfitted with your bicycles. If the tour company didn’t do it this way, you would have to ride the bike up the steep mountain, and no sane person wants anything to do with that nonsense. The Welcome to Alaska sign is located at the summit, so you can take some fun pictures with your friends before you begin your bike ride. Such thrills! The bicycle ride back down the mountain is about 15 miles long, but it’s almost all downhill. Your hands will get more of a workout than your legs as you pump those brakes like a madman. Keep an eye out for bears because sometimes they are on the side of the road and you are on a bike. Also, watch your guide because they signal you when a giant tractor-trailer is coming up behind you on a steep downhill slope. You definitely want to stay out of their way. Much Adventure! What does that even mean? Who shakes a stick at something they like? For that matter, who goes around shaking sticks. Seems irresponsible to me. Anyway, we hope you enjoy your White Pass Railway and Klondike Bicycle Tour while in Skagway because it truly is the best of both worlds. You get a train ride, a van ride, and a bicycle ride, so…. wait a second… that means it’s the best of all three worlds! What a deal!